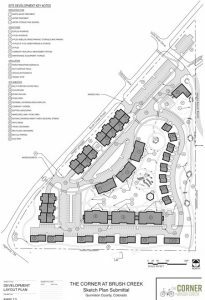 The proposed 240-unit Brush Creek affordable housing project is officially in the Gunnison County review pipeline. Cathie Pagano, Gunnison County director of community and economic development, verified last week that the application was complete, thus beginning the review of the proposed sketch plan. The first work session with the Planning Commission is scheduled for October 20 at 9 a.m. in Gunnison. A site visit with the Planning Commission will take place that same afternoon. That translates to 156 units that would have a deed restriction and rental caps for households making less than 180 percent of Area Median Income (AMI). That currently means a single person would have to make $89,280 or less. A four-person-household could make up to $127,440 and qualify for one of the restricted apartments. The units would be spread across 30 apartment buildings ranging from eight duplexes to three 24-plexes. A transit center to serve the RTA bus, intercept parking spaces, open space, a general store/coffee shop and on-site management office are all part of the plan. As far as living space, the development would include seven different unit types, from 500-square-foot studio efficiencies to 1,300-square-foot three-bedroom units. 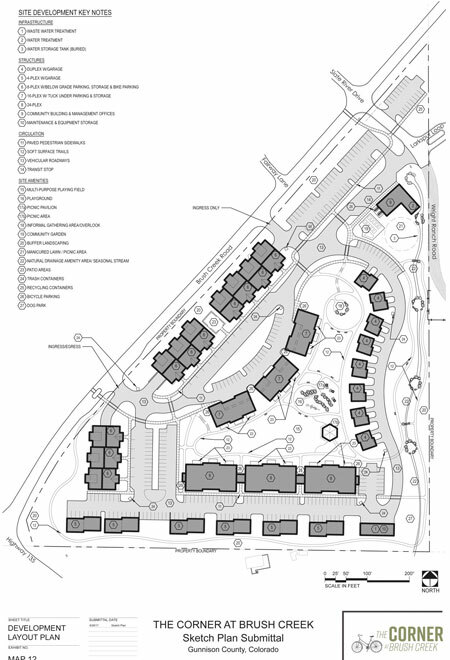 The plan is to have 32 studio units, 64 one-bedroom units, 120 two-bedroom units, and 24 three-bedroom units. The proposed sketch plan anticipates a development in which vehicles would not be needed. “The Property is close enough to walk, bike, or ski to the Town of Crested Butte. Alternatively, the bus system could be used to reach the Town of Crested Butte, Mt. Crested Butte, or Gunnison. A car would not be needed to live in the proposed development,” the sketch plan introduction states. “The proposed development will address the dire need for housing for the local workforce, which will help maintain the sense of community and strengthen the local economy,” it continues. The most noticeable immediate infrastructure issue is how to provide water and sewer service to the project. “Water supply and wastewater treatment are known issues that the team believes are surmountable,” said project spokesperson John O’Neal. Wastewater treatment is more difficult. The developer is looking to build its own wastewater treatment facility or strike a deal with the town of Crested Butte to extend sewer service to the project. The sketch plan states that connection to the East River Regional Sanitation District treatment plan has been considered but it is the least preferred alternative due to the significantly higher augmentation requirement created by delivering wastewater return flows from the Slate River basin to the East River basin. Project attorney Kendall Bergemeister of Law of the Rockies has a letter to the Planning Commission included with the sketch plan, admitting the water and sewer service could be complicated in such a scenario. If that is the case, “Each one of the above alternatives [outlined in his letter] would be expensive and time consuming to implement, most would require water court approval, and all would almost certainly adversely impact Gatesco’s ability to offer housing at affordable rates,” Bergemeister’s letter states. O’Neal summarized the project as filling a need for the upper valley. 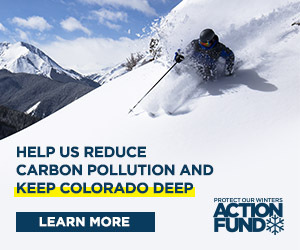 “The housing need is very real… you regularly meet people living in their cars, living in tents, long-time locals couch surfing, all fighting to make Crested Butte their home. The needs are real,” he said.